An online master's degree in project management can help professionals develop more expertise in their field. This degree may also be useful for people who want to make a jump into a different area of the discipline. Students studying for an online project management master's degree often learn about budget allocation, application of theoretical ideas and risk management. Graduates with this degree may also have an advantage when applying for leadership or management roles. Discover more below about typical coursework, program requirements and admission standards. Many students seek out online degree programs because of the flexibility they can provide to working professionals and students with family commitments. Pursuing an online master’s degree in project management can help students diversify their expertise, specialize in a field and create greater opportunities for pay raises and other jobs. Searching for online programs can be intimidating because there are so many; however, utilizing the rankings list below can help ease the decision-making process. These programs have been ranked based on factors like graduation rates, tuition fees, student services and peer-based value. The masters of science in project management offered by Lewis University aims to develop the leadership, communication, and management skills in you. Among the many benefits offered by this university are convenience and no waiting time. They have rolling admissions which mean you can start getting your master’s degree any time you decide. The program consists of a total of five semesters. Classes are usually slated once a week with a time slot of 6PM to 10PM, in order to easily accommodate working adults. As a project management degree holder from this school, you are qualified to take the Project Management Professional examination. Tools and knowledge to complete projects before set deadlines, avoid going over budget and successfully hire and manage project team members are outcomes of Lehigh University's Master in Business Administration Project Management degree program. Corporate entrepreneurial ship, finance, marketing, international business and supply chain management are other concentrations that MBA majors can declare. Twelve credits of the MBA program focus on project management. Courses that make up these 12 credits include scope management, project risk management and decision making and ethics on projects. Instructors deliver class materials on a flexible, part-time schedule. Graduate students will gain a deep understanding of the core principles of management practice and theory through Harvard University's management master's degree program. Subject matter includes marketing, accounting, economic theory, organizational behavior and finance. At least four of the 12 required courses will be taken on campus. The Harvard Extension School is home to a wealth of resources, including career services, library and research tools, a writing center, money management resources, and computer and email services. The Completing Your Degree section contains all relevant information on thesis work and academic advising. Brenau University is one of Project Management Institute's registered education providers. The Master of Business Administration in Project Management at Brenau University consist of preparatory, core and concentration courses. MBA foundations and introduction to business communications are the two preparatory courses. Together these classes total six credits. Nearly 39 additional credit hours are required to complete the degree. During classes, students learn how to tie projects into budgets. They also learn about contract management and ethics. Project Management program has several aims, including preventing project managers from making costly mistakes, getting maximum output from team members and meeting project timelines. It is these aims that University of Mary seeks to offer adults interested in leading projects in its Master in Project Management degree program. The program is an online offering that generally takes two years to complete. To graduate sooner, students could get approved to enroll in the accelerated option. It takes 18 months to earn the accelerated degree. Up to seven concentrations fall under the degree. Examples of these concentrations are energy management, healthcare, human resources and public administration. Florida Institute of Technology offers four project management master's degrees. Project managers, adults in middle management leadership roles and other administrators can pursue a Master in Business Administration with a project management concentration or a Master of Science in Project Management. The school's other two project management master's degrees emphasize information systems and operations research. The MBA degree is fully online. Students pursuing the other three degrees have the option of completing their degree online or on campus. Courses built into the programs cover topics like statistics, economic analysis and leadership. Learning is provided through lectures, workshops, class discussions and guest speakers. The master of business administration degree program at Upper Iowa University immerses students in the concepts of risk assessment, ethical management and department integration. There are five possible areas of emphasis, but all include instruction on corporate legal issues, economics and market analysis. No matter the chosen concentration, all students will complete a research report as part of a capstone seminar assignment. Regionally accredited by the Higher Learning Commission, the program does not require students to live on campus. Students can earn the degree at several campus locations or online through distance education. Saint Joseph’s University offers a master of arts in organizational leadership that emphasizes organizing and motivating people—the human side of business. They also offer a second program, the master of science in organizational development, which focuses on training students to guide a business during growth and success, as well as managing strategic change. The third program they offer, the master of science in organization development and leadership, combines the best features of the first two degrees. Application to the program is on a rolling basis and is offered six times a year. The Drexel University College of Engineering offers a graduate-level project management program that culminates in a master of science degree. The program is designed for working professionals who are at the mid-level of their careers and is delivered in a part-time format to allow greater flexibility. The degree could apply to a range of industries in the public, private and nonprofit sectors. The curriculum includes global leadership skills, team building, strategy development, communication, and both single-project and integrated-project management skills. The program can be completed in as few as two years. A master’s of arts in administrative leadership is offered by the University of Oklahoma. This makes it a perfect option for working adults who want to enhance their strategic thinking and leadership skills. During this 33-hour curriculum taught entirely online, students are taught organizational communication, project management, and theories of management and leadership. The program spans three semesters of schooling, and the flexible online courses allow working adults to advance their careers – no matter the field – while attaining a degree. Students must maintain a grade point average of 3.0 to graduate. Applicants for online degree programs often have different personal needs or goals that play into account when selecting a master's in project management program. The search tool below allows prospective project management students to filter programs based on varying needs and helps to ensure unbiased, accurate information. Search for online master's in project management programs according to state, degree level, subject, accreditation, cost, student population and private or public school type. Depending on the specific online master's in project management program a student chooses, he or she may finish their coursework anywhere between eight months to two years. Applicants should make sure they have completed necessary prerequisites to ensure a smooth application process. Many of these requirements may have been completed during a bachelor's program. Prospective students, however, should be sure to compare their undergraduate coursework history to the specific requirements of their desired program. Advanced degree exam scores, like the GRE or GMAT, and work experience in the field will likely be required too. See some common requirements for the application process and what a sample two-year timeline may look like below. Students seeking an online master’s in project management often can expect to take classes that combine technological coursework found in a traditional engineering degree with the business courses found in a master’s in business administration degree. This type of course load helps expose students to both the business side and the technology side often required for a master’s in project management degree. Fulfilling this type of degree online may allow working professionals to continue their jobs while advancing their education and earning potential. The first step in getting to know potential master’s programs for project managers is to understand common steps in the application process. Program costs may differ, but most programs will typically require 36-48 credits at as much as $1,000 per credit. Students should explore financial aid as much as possible to help with the costs of pursuing an online master’s in project management degree. Individual programs and departments may have scholarship applications, and some may accept aid programs like Free Application for Federal Student Aid, also known as FAFSA, or federal grants. Most degree programs accept GRE or GMAT test scores for up to five years after completion. Some programs may only accept one test score and not both, so students should be sure to take the exam that is specific to their program of interest. The GRE is comprised of six parts, including analytical, verbal reasoning and quantitative reasoning sections. It is scored on a 130-170 point range. The GMAT is made of four longer sections of similar focus and is scored from 200 to 800. Many online master’s programs in project management require up to a year of work experience in the field. If prospective students plan to head directly into an online master’s program after completion of their bachelor’s, they should be sure to start gaining experience before graduation. Online master’s programs in project management often uphold more rigorous GPA requirements for entrance than other fields. Students still completing their undergraduate courses should keep in mind that a 2.75 GPA on a 4.0 scale is often the lowest accepted. It may be better for students, however, to try to maintain at least a 3.0 as minimum GPA requirements may vary. Résumés and admissions essays may give applicants a chance for entry if their GPA doesn’t meet the minimum. Prospective students may be required to submit letters of recommendation to speak to an applicant’s character, personality or work-ethic. Current supervisors, professors or community leaders are often suggested recommenders. Admissions officers often want to know who they are accepting into their program beyond the standard application. These programs may require a personal statement or essay to learn more about prospective students on a personal level. Personal statements and essays can allow students the opportunity to describe who they are, what about a master’s in project management is interesting to them and what they plan to do with their degree. For international students or students for whom English is not thier native language, a Test of English as a Foreign Language (TOEFL) score will often be required. A degree that is comparable to a U.S. bachelor’s degree is typically required as well. Students can often expect to encounter and surpass several hurdles during the first year of an online master’s degree program in project management. The first year of study is typically dedicated to core courses and narrowing down a focus or specialization in project management. Different programs have different core requirements, but many core course are comparable and related across the varying programs. Students will generally study material surrounding risk management, finance, e-commerce, and quantitative and qualitative decision-making during their first year. Some students may be interested in resource planning while others may be interested in scheduling and logistics. Graduate students may need to narrow their focus to help determine the specific path they’ll take in their program and subsequent certifications. Students pursuing an online master’s degree in project management may finish their coursework within one year, so it’s important for participants to begin expanding their network immediately. This can help expose graduates to potential jobs and better opportunities after they complete their degree. Students who are not already working in the field or who have taken a break to start their online degree program may want to look into internships or similar opportunities through their degree programs. Students can often take advantage of these experiences to help get experience, expand their network and get real information on potential specializations within the field. Students who are already working in a firm while pursuing their degree often can expand their experience and field knowledge by utilizing their resources within their current job. Many students will complete an online master’s degree in project management within two years. The second year of study generally involves both coursework and work experience. Students are often recommended to have a clear idea of the particular niche in which they would like to specialize before they graduate. Students will typically need to complete special classes related to specific areas of the project management field. Example of these classes may be project management, communications management, risk and cost management, and program management. Some students may advance their position within their current job after graduation. Others may be applying for new careers. It is recommended for students to begin the application process early as it may take time to find a well-suited job fit in this new field. Students who complete an online master’s degree in project management may have many options available to them upon graduation. To put themselves in a position for career advancement, graduates should prepare for a certification exam that best correlates to their specific field of interest. Regardless of specialization, however, all students should consider taking the Project Management Institute (PMI) Project Management Professional certification exam. Candidates for an online master’s degree in project management are recommended to maintain a good GPA, represent themselves well within the project management network and complete any work experience or internships to the best of their ability as these factors may contribute to possible career and certification opportunities. Membership of relevant community organizations can help expand graduates’ networks and may offer additional opportunities after graduation. Students should consider joining Project Management Institute, which offers member discounts for certifications. 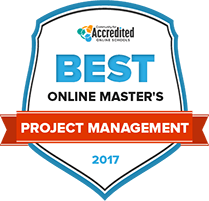 Online master’s degree graduates can often advance their careers and supplement their degrees with project management certificates. Many different credentials match with the varying roles a project manager can have. For example, an RMP certification is for Risk Management Professionals, an ACP is for Agile Certified Practitioners and an SP is for Scheduling Professionals. Graduates of an online master's in project management program may have a diverse range of opportunities available to them. Organizations often employ project managers across a diverse field of industries as good project management can by key in giving businesses a competitive edge. Below are a few career paths available for those with a master's degree in project management. Engineering managers are typically responsible for leading teams within engineering companies on specific tasks and activities. They often plan, direct and coordinate each task and require great leadership and communication skills. IT managers are generally responsible for directing all computer-related activities within an organization. Taking into account all computer technologies, including software and web tools, these professionals often identify the information technology goals of an organization and are responsible for implementing them. These professionals typically evaluate the cost of making a product or providing a service, while considering the time, money, materials and labor involved. Cost estimators generally work in offices and may frequently visit job sites. They usually specialize in one particular industry. Students will typically learn how to assess security and risk factors within work environments in order to ensure that systems can operate smoothly. Courses may address the potential risks in both the public and private sectors. Topics learned often include social and emotional effects of crises on workforce and productivity, organizational infrastructure and framework of planning, organizing and controlling work environments. In order to effectively manage a team, students will usually learn strong leadership and communication skills. Students will typically also learn the principles and philosophies behind effective communication and leadership strategies. Topics learned may include conflict resolution, motivational tactics and negotiation skills. Technology is generally a critical part of any business, and knowing how to use it effectively can be crucial for efficient business operations. Students will typically gain an understanding of how internet and web technology can solidify strong communication with employees and consumers. Topics learned may include online payment methods, security, communication strategies and website management. Students generally will gain a macro view of how international business, culture and politics can affect a business. These principles will typically include how monetary policies, economic activity, production costs and geopolitical factors can influence the success of a public or private business. Topics learned may include taxation, legal environments, labor policy and international cultural identities. After completing on online master's degree in project management and entering the field, professionals should seek to further their careers and their networks by joining the industry's organizations. Many resources are available for project managers who wish to advance their careers, continue their education and widen their community. Membership with this association offers continued training and professional development for project management professionals. Seminars, podcasts, web events and news articles are available to help increase skills in communication, finance and writing. This organization advocates for the profession, advancing its recognition and growth worldwide. It offers certification and professional development to its members and member associations and is available for both individuals and corporations. The Project Management Institute offers membership to individuals seeking to advance their careers through certification and continued education. Members can also benefit from local connections through varying chapters and its global community of members.